Use the 5 second rule to achieve your goals and get anything you want. A few years ago, Mel Robbins was going through a really difficult time. She and her husband were mired in financial trouble, and their relationship was strained. Every night she would tell herself that the next day she would get up early and get started on pulling her life back together. Nonetheless, every morning the same thing would happen. The alarm would ring, and Robbins would roll over, turn it off, and go back to sleep. She would wake up late, feel like a failure, and get little done throughout the day. Then, one day, she heard the countdown to a rocket launch on TV. Something clicked for her at that moment. She told herself that when the alarm went off the next morning, she would count down from 5 to 1 and then “launch” herself into the new day. The next morning when she tried her new idea, it worked like magic. She was able to get up early and start her day off right. In addition, she started applying the idea of counting down from 5 to 1 and then acting every time throughout the day when there was an important task that she needed to get done but which she felt like putting off. The concept worked so well for her that she gave it a name—the 5 second rule. Robbins started doing research to try to understand why the rule was working so well for her. She found tons of scientific evidence which backed up her belief that the rule was a life changer. So much so that she wrote a book about it: The 5 Second Rule: Transform Your Life, Work, and Confidence with Everyday Courage. In this post I’m going to explain the 5 second rule to you in more detail, and I’m going to give you tips on how to apply it in your own life. Robbins explains that when you feel an urge to work on a goal, your heart is trying to tell you that there’s something you need to do. You then have a 5 second window to get started on that goal before your brain talks you out of it. Start counting backwards to yourself from 5 to 1: 5-4-3-2-1. As soon as you hit “1”, push yourself to move. You have to take physical action! As you count down from 5 to 1 you’ll be distracting your brain from coming up with reasons why you should do something else instead –like watch cat videos or reorganize your book shelves. In addition, you’ll be placing all your focus on the goal that you’re trying to get yourself to work on. Finally, counting down from 5 to 1 is a starting ritual. It will interrupt old behavior patterns and trigger new ones. The 5 second rule is a brain hack. It’s a form of metacognition which allows you to trick your brain so it can’t sabotage your efforts. There’s more on this in the next section. All of these things can prevent you from acting. And the reason that doubt, fear, and overanalyzing occur is because your brain is designed to stop you from changing. This is because change is uncertain, scary, and new, and your brain’s main function is to keep you safe. However, the opposite is also true. In 5 seconds you can get yourself to act by using the 5 second rule. The Feelings are Just Suggestions Principle. The Do Good, Be Good principle is based on research done by Timothy D. Wilson, Sherrell J. Aston Professor of Psychology at the University of Virginia. The principle states that you can’t think your way toward being happy or successful. Instead, if you want to be happy and successful, you must act. The 5 second rule pulls you out of your head and gets you to take action. After all, it’s not 5-4-3-2-1, think. It’s 5-4-3-2-1, act. At the same time, the more that you act, the more that you create a bias toward action. That is, you’re turning action into a habit. In her book, “The Progress Principle: Using Small Wins to Ignite Joy, Engagement, and Creativity at Work”, Teresa Amabile—a Director of Research at Harvard Business School—states that the power of progress is fundamental to human nature. Making progress, even in small ways, is key to our productivity and happiness. The 5 second rule allows you to make progress every time you use it. And, according to the Progress Principle, every small step forward improves your mood and increases your intrinsic motivation. Both of these things, in turn, encourage you to make even more progress. In the book, Descartes’ Error: Emotion, Reason, and The Human Brain, world-renowned neuroscientist Antonio Damasio indicates that his research suggests that 95% of our decisions are made based on feelings, not facts. He therefore calls us “feeling machines that think, not thinking machines that feel”. This is why we can have a list of great reasons why we should act, but then we fail to act because we simply don’t feel like it. To solve this problem, Robbins recommends that we use the strategy applied by professional athletes. They treat feelings as simple suggestions. If a feeling is simply a suggestion, it can be overruled—for example, with the 5 second rule. In addition, when you act you’ll be using behavior to impact how you feel, instead of hoping that your feelings will encourage you act. Most of us tend to procrastinate every now and then. Especially when it comes to things which require a lot of physical, emotional, and/or intellectual energy. Procrastination can cause small problems, such as having to pay a late fee for an overdue library book. However, if left unchecked, procrastination can cause serious damage to your health, career, relationships, and overall well-being. As I explain in my eBook, “Make It Happen! A Workbook for Overcoming Procrastination and Getting the Right Things Done”, procrastination isn’t about being lazy or having a poor work ethic. In addition, poor time management skills are only partly to blame. Procrastination, at its core, is about negative thoughts and emotions. These negative thoughts lead to avoidance. What you need to do is to bypass those negative thoughts. That’s where the 5 second rule comes in. When you count backward– 5 4 3 2 1 – the brain stops thinking (because it’s concentrating on counting backwards), just for a few seconds. But those few seconds are enough to start acting. Remember, if you hesitate you give your brain the opportunity to talk you out of acting. But if you count backward and start acting as soon as you hit “1”, by the time your brain figures out what’s happening, you’re already on your way. That is, you’ve overcome procrastination. 1. The best way to use the 5 second rule is to combine it with other strategies that will allow you to get more done. 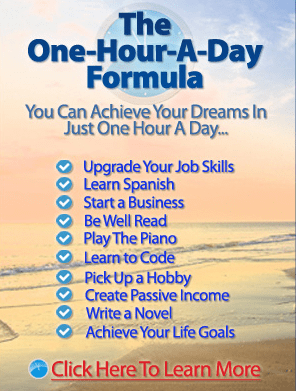 Sign up for my free email course, The One-Hour Goal Strategy. Then, when it comes time to act on your one-hour goal, use the 5 second rule along with all the other things you’ll learn in the course to get to work on your one-hour goal. 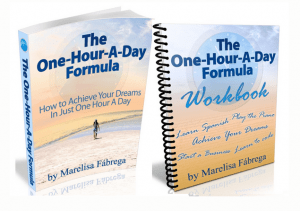 Or, you can really get things done with my eBook, “The One-Hour-A-Day Formula: How to Achieve Your Dreams In Just One Hour A Day“. 2. There’s something called the habit loop. It consists of a cue, a routine that’s triggered by the cue, and a reward. If you want to change a habit, what you have to do is change the routine that follows the cue. The next time you’re cued to engage in a bad habit, use the 5 second rule to carry out a different routine, instead. 3. If you have to make a simple decision, instead of overthinking, use the 5 second rule and simply decide. 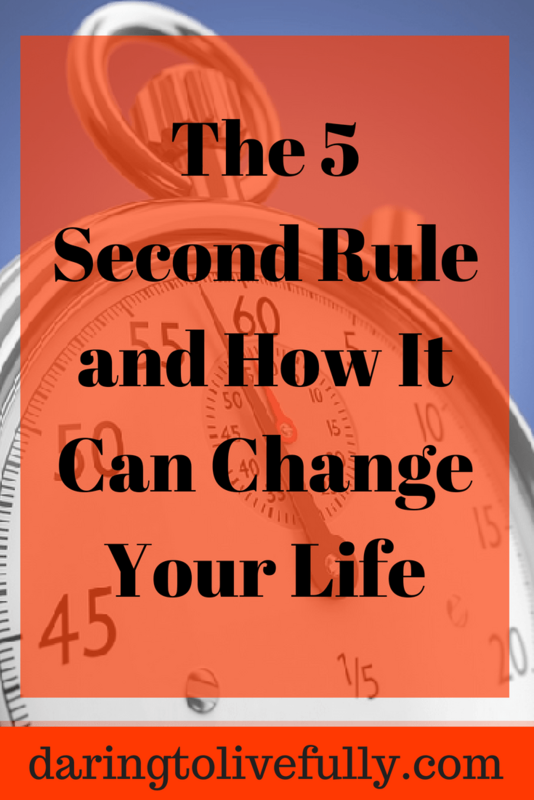 The 5 second rule is a simple rule you can start using right away. In addition, the more you use it, the better it works. Soon you’ll start associating the countdown from 5 to 1 with taking action, and it will become automatic. Live your best life by applying the 5 second rule.